Eastern Recycling is an undercover waste recycling station located in Ringwood where we process incoming waste into usable components. Simply drive in, unload your waste and go… we’ll take care of the rest, our team of recyclers separate your rubbish into basic groups keeping as much as possible for other uses and only committing what little we can’t recycle to landfill. Green Waste is sorted removing any contaminating waste and then mulched. It’s then taken to companies who further compost, screen and process it, creating a marketable and viable gardening product. Concrete is dispatched to concrete recyclers to be crushed back into various grades of crushed concrete/crushed rock for use in road making and paving etc. Timber products are sorted, removing waste and contaminants and also separating out any treated timber or processed particle boards. We then dispatch it for processing at a timber waste recycling facility. Timber Waste typically ends up as garden topping mulch often coloured for an aesthetic, stylish finish. Soils are separated out, screened and dispatched as a fill product often to developments such as golf courses or to re-contour a site for building or landscaping purposes. If you are filling in an old swimming pool or require a structural/engineered fill material, please give us a call. We have our soil periodically tested for suitability and consistency as a Structural/Engineered Fill. Paper is collected and dispatched for recycling (we provide a bin where you can deposit your paper). Please ensure it’s clean from metal, plastic and polystyrene packaging. Sellotape and staples etc. are acceptable. Paper must be stacked and boxes flattened to ensure no contamination within. Bricks & Masonry are sorted, the fines (soils) removed and litter picked out creating a clean masonry product with some balled clay (that rolls over our screen). 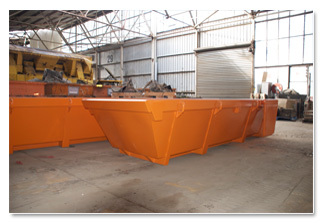 This is then dispatched to fill and construction sites and even used as a product in landfill to generate hardstand and haul roads for vehicle access. Better to use a recycled product than to manufacture new materials. The balled clay helps to bind and seal the hardstand. In recent months we have even started and are assessing the viability of collecting full bricks for dispatch to brick cleaners for reuse. Bluestones and volcanic rocks are similarly separated. Scrap Metals are sorted and dispatched for recycling. We also separate out where possible stainless, copper, brass, lead and aluminium and provide a pallet for used car batteries which are also sent off to be recycled. 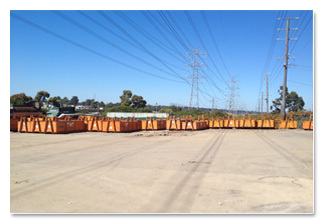 If disposing of car batteries at our transfer station, please ensure they are handled, then placed so as not to leak. Waste Oil. We provide a drum at our transfer station for you to safely dispose of domestic quantities of waste motor or hydraulic oil only. A waste oil recycler, who reprocesses the oil for reuse, periodically empties it. Rubbish is taken to landfill. Rubbish includes anything that is not recyclable or not economically viable to recycle. This includes materials such as particle board and laminates, carpets, plastics and polystyrenes, plaster and cement sheet, old and broken toys, televisions and electrical goods, cabinets, couches and chairs, glass, dirty recyclables such as green waste mixed with fencing wire or timber with steel or concrete attached, materials with plastic or shade cloth attached and painted timber. 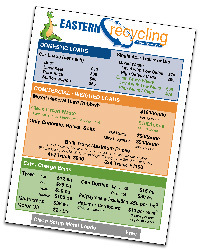 All loads that are received through Eastern Recycling’s Transfer Station or ER Bins are sorted, categorised and where viable the constituent materials are sent for recycling. It needs to be noted that recycling is not free or cheap. Almost every product we produce or separate out has a disposal cost. This cost includes transport as well as the sorting and handling costs and the cost of general business. Customers often comment on our cost to handle their waste, however like other private transfer stations we are yet to receive any grant’s, funding or help from any government or council departments. We are here to build a viable business and are very proud that we provide a recycling alternative to bulk gross landfill. All personnel/customers must report to the weighbridge before entering the premises. All children and animals must stay inside the vehicle at all times. All people who are not unloading must stay inside the vehicle at all times. All commercial customers must wear safety vests and foot protection. A speed limit of 5km per hour applies while driving in and around the yard. Stay close to your vehicle and be aware of moving plant. Toot your horn to get the attention of machine operators before proceeding to drive past. Please follow all instructions given to you by yard staff in the undercover and surrounding areas. No asbestos containing or other hazardous material may be disposed of at this facility. If you are unsure, please ask one of our staff and they will advise you as to whether we will accept the material or not. Hazardous, contaminated or dangerous materials. Putrescibles (putrid) waste such as food scraps, household garbage, sewerage etc. 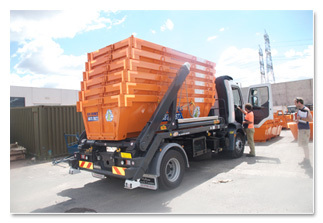 - Clean loads must NOT contain any other waste or products at all. - Clean Soil is dry sand, silt or soil only. It does not contain any grass, roots or rocks. Mattresses All Sizes $20 ea. Gas Bottles Under 9kg size $15 ea. 9kg size and over $30 ea. Tyres - Car $10 ea.